If you are a law abiding citizen most of the time, having some blue colored lights flashing right behind you, with the headlights signaling you to pull over to the side, chances are your blood might freeze, while you start to think about how much money you might have to spend to pay off the ticket. A voice might hail you over the hailer, and hopefully no one you know will actually drive by as you slink lower into your seat. Well, back home, you can vent out your frustration with the $59.95 Talking RC Police Cruiser. 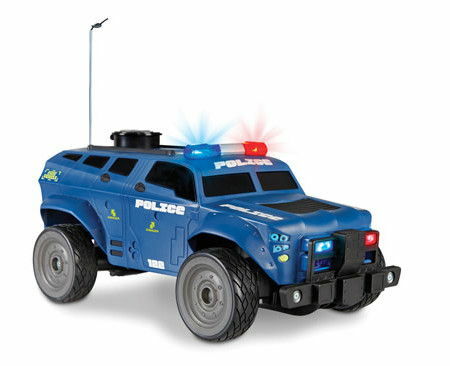 This particular Talking RC Police Cruiser will allow home enforcers to actually record their very own message in order to broadcast messages to potentially naughty children. A single touch of a button on the roof itself will allow officers to be able to record a good 15 seconds of audio, where one can then instruct suspects to “Drop that toy!” or “Stay out of my room!” The recording will sound like an instruction which can be uttered via megaphone, all coming through an officer within the car. This heavy-duty SWAT vehicle will feature off-road tires that will allow it to “pursue” suspects over rough terrain, sporting eight bright flashing LEDs in the grille as well as light bar that will be able to disperse traffic during high-speed chases. Other sounds that can be played back would be a siren and other emergency sounds. Powered by five AA batteries, while the controller will run off a pair of AA batteries. Surely this is more fun than other kinds of remote controlled toys?